Most of Ian Fleming's James Bond novels were included in the Box Of Paperbacks, and what I don't have, I'll almost certainly pick up and read anyway. The series keeps surprising me. Just when I think I have Fleming's formula nailed, and can largely predict what the novel's hero is all about, both take unpredictable turns. And just when I think Fleming's writing can't provide a better window into a certain way of seeing the world, one shaded by the impotent paternalism of a fast-fading empire, I hit a book like this, which sees in '50s Istanbul everything a refined English soul finds distasteful about the rest of the world. We'll get to that later, later even than usual. In a daring gambit, Fleming opens From Russia With Love with a section called "The Plan" that doesn't even mention Bond for a few chapters. Fleming's hero doesn't take the stage until "The Plan" gives way to "The Execution" about a third of the way in. It's a simple structure that works incredibly well: First we watch the construction of an elaborate mousetrap, then we watch Bond unwittingly stumble into it and attempt to claw his way out. First, however, we have to meet the makers of the trap, most drawn from the upper ranks of SMERSH, the Soviet counter-intelligence agency that, I have to shamefacedly admit, I thought was just a Fleming invention until I read this book. Turns out it was real enough, its acronym really taken from the Russian words for "Death To Spies." What Fleming doesn't mention is that it didn't officially last beyond WWII, though he insists in the introduction that "when this book was written the strength of SMERSH at home and abroad was about 40,000." Maybe he was just off by 40,000 or so. It hardly matters for the sake of the novel, however. Here, SMERSH is the all-seeing, all-knowing, endlessly malevolent barbed tentacle of the Communist threat. The key players include Rosa Klebb, an aging, bisexual espionage veteran, and Red Grant, an Irish-born slab of beef who has turned his hatred of the English and his love of thrill-killing into professional advantages. SMERSH's plan is twofold: death and humiliation. They seek to discredit England's super-spy by creating a scandal that will dog him even after his death. To this end, they recruit a pretty young civil servant named Tatiana Romanova–her resemblance to a young Greta Garbo is mentioned repeatedly–to pose as a defector who has fallen head-over-heels for Bond via his dossier. After falling for her story, he'll be killed, with incriminating photos and a false tale of betrayal sent to sympathetic leftist newspapers. Numbness was creeping up Bond's body. He felt very cold. He lifted his hand to brush back the comma of hair over his right eyebrow. There was no feeling in his fingers. They seemed as big as cucumbers. His hand fell heavily to the side. Breathing became difficult. Bond sighed to the depth of his lungs. He clenched his jaws and half closed his eyes, as people do when they want to hide their drunkenness. Bond collapses thinking of Tatiana. When I read this, I thought it was an attempt to end the book with a cliffhanger, but apparently Fleming seriously meant to off his master spy with this outing. The sloppiness that bugged me makes a lot more sense in that context. It's not as if Bond is asking to die, but he isn't on guard the way a good spy should be, least of all with his heart. As usual, Bond falls for the girl of the book, but Tatiana is much less a good match for his affection than any of her predecessors, particularly Tiffany Case, who, as the novel opens, has returned to America. Tatiana is pretty and passive. She doesn't know that her affair with Bond is supposed to end with his death, but she knows it's not meant to end well, and she goes along. She falls for Bond, but she never falls fully, and her commitment to defecting seems pretty half-hearted. 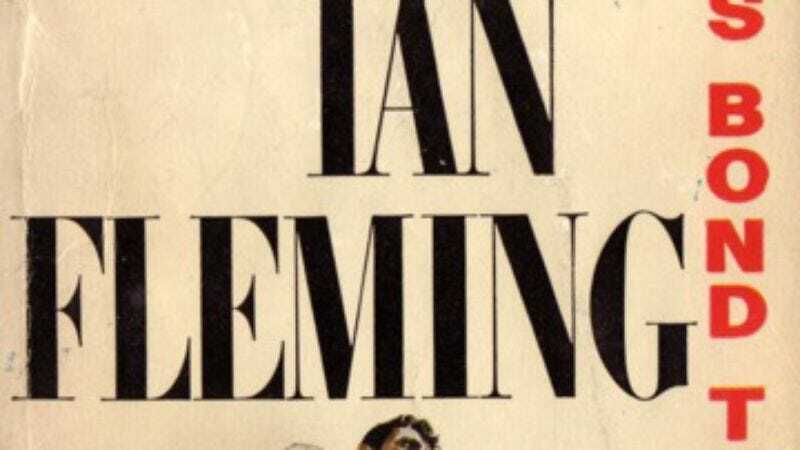 Maybe Fleming meant Bond's death as a cautionary tale against getting lukewarm and sloppy when so much was at stake. [T]he old European section of Istanbul glittered at the end of the broad half-mile of bridge with the slim minarets lancing up into the sky and the domes of the mosques, crouching at their feet, looking like big firm breasts. It should have been the Arabian Nights, but to Bond, seeing it first above the tops of trams and above the great scars of modern advertising along the river frontage, it seemed a once beautiful theatre-set that modern Turkey had thrown aside in favour of the steel and concrete flat-iron of the Istanbul-Hilton Hotel. Its people invariably get described as "swarthy" and "oily." Darko Kerim, Bond's ally during his Istanbul stay, tells his friend of his upbringing as the child of an English governess and a Turkish strongman with many children by many women. He seems to hate the things that make him Turkish. He can barely even stomach Turkish food. "A pilaf or some of those damned stuffed peppers they eat here?" he suggests to Bond. "All right then. And you must start with a few sardines grilled en papillote. They are just edible." Characters with mixed nationalities don't fare well here. Grant is "the result of a midnight union between a German professional weight-lifter and a Southern Irish waitress." It's suggested that this has something to do with Grant's distaste for the English. In people and in cities, Fleming seems to be something of a purist. But by the time he wrote From Russia With Love, that kind of purism was becoming impossible. Still, at least part of Fleming's unease with Turkey probably stems from having been in Istanbul during the ugly Istanbul Pogrom of 1955, a violent attempt to purge the city of its Greek community that was, by all evidence, unofficially sanctioned by the government. All Zora had to do was to fall on the other girl. Vida's head would crack down on the stone and then Zora could do as she liked. But all of a sudden it was the big girl who began to scream. Bond saw that Vida's head was buried deep in the other's breasts. Her teeth were at work. Soon, the clothes are off and the fight looks like it's about to take a fatal turn, when a shot suddenly rings out. After Bond and Darko save them all from some Russian infiltrators, Bond is prompted to ask the tribe's leaders to save both women from death. "Your heart is too soft for a good fighter," the man tells him via Darko. For now at least, Fleming seems to agree. The shifting world appears to have no room for a refined spy like Bond.